Working in a field service environment such as the utilities sector, comes with challenging environments and conditions in which the standard consumer device simply cannot perform. Water, dust and debris can all spell disaster for today’s modern devices, never mind dramatic changes in temperature or falls from a height. Products that offer constant functionality and extreme durability are essential for the mobile worker and provide greater overall performance. Software and devices that are suitable in the field service environment can be hard to come by, so here’s a list of key points and features to look out for when searching for your next device. Having access to the latest technology is a must in this day and age. Being able to work productively and efficiently is essential for all roles regardless of where and when you work. Working in most field service roles means you need the ability to access and communicate information in order to work effectively. Most work will inevitably be carried out in hazardous or remote locations, both of which provide far from optimal working conditions. Rugged laptops and devices with the technological ability to perform are the answer to this problem. 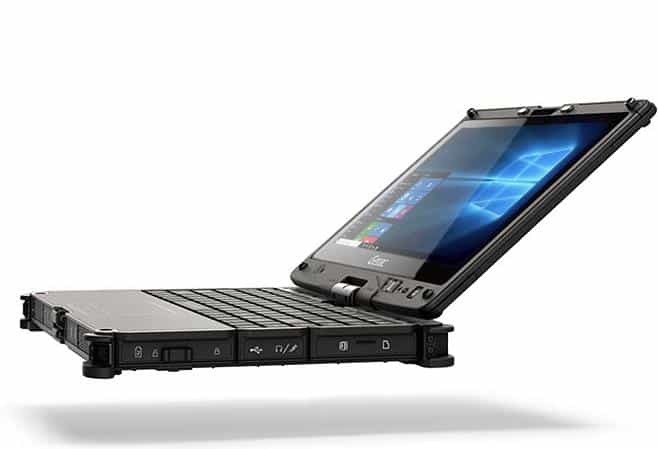 These mobile devices offer super-fast processor flash storage, high quality graphics, quick performance and the multi-tasking capability that’s necessary in challenging work environments. For example, covering a full shift or deployment can be a challenge without using the latest developments in technology, like hot-swappable batteries that allow you to switch batteries without shutting down or interruption. Keeping your data, information and work safe is always important, although it can be a difficult task. Tablets and mobile devices can be equipped with a variety of security features and software to increase security and protection. For example, incorporating software which disables your device once it detects an unauthorised entrance should be a first precaution. You can even equip yourself with anti-tampering devices and access scanners to add extra layers of protection to your data. Screens are by far the most important part of any device, but they’re also the most susceptible to damage. Finding a screen that’s functional, good quality and durable is a challenge, but they are available and almost essential for operatives working out in the field. One manufacturer’s revolutionary Lumibond 2.0 technology, for example, offers an extremely durable screen which bonds a glass display with a touch screen and an LCD, enhancing touch functionality whilst providing a more readable display in all conditions. While tapping, pinching and zooming is second nature to consumer device users, projected capacitive multi-touch technology doesn’t work with gloves on or in the rai. Lumibond screens, on the other hand, allow you to use gloves and pens as well as your fingers, even when the screen is wet. Being able to work in any environment is critical. Altitude, temperature, precipitation, water and dust can all spell disaster for most standard electronic devices, which isn’t ideal for the operative in the field trying to communicate with their base. From the freezing cold to heat as high as 60°C, you need ruggedized equipment with integrated heaters and optically bonded displays that can cope in extreme temperatures. Many rugged devices built for utility engineers are ATEX certified, meaning the product has been tested for performance and functionality in Zone 2, where there is the risk of potentially explosive atmospheres from flammable gases, vapours, liquids, dust and ignitable fibres. Working in the field often means the number of devices you can carry are limited so it makes sense to purchase items that can complete multiple tasks. Rugged devices that are designed with utility engineers in mind are often able to capture a wide range of data, enabling maintenance staff to maintain assets and manage parts. For example, rugged devices often come fully equipped with barcode scanners that are capable of capturing both 1D and 2D codes, up to three times faster and more accurately than standard scanners, from a distance of nine inches. You can find models that also feature integrated high-frequency RFID readers, so your staff can scan electronic data from tags and capture positioning data, in addition to tracking purposes; saving businesses from buying multiple devices to complete different tasks effectively.